We must know the importance of SEO factors while building a blog or website. There are several SEO factors that Google considers before ranking your website. There were many factors that were important in the past but now no longer given importance. Before we go into the details, in the first place, let’s examine what is SEO? SEO has always been in existence since the search engines existed. There are two methods of doing SEO – white hat and black hat. White hat is about doing the SEO as per the Google’s specifications and black hat is getting higher rankings by malpractices. Black hat is never recommended but when it comes to white hat, people use to overdo something which alerted Google and things change. All the above methods are no more effective, in fact, if done now, you might face the penalty from Google. Being said that, there are some SEO factors or methods which are important and will always remain important for getting high ranks. The first thing to remember is about the keywords we use. All the search is based on a keyword – by typing or now mostly by voice. Some experts say that voice is taking over and so you should optimize your site for voice search as well but as per my opinion, it is after all keywords, be it voice or texts that get you the results. You always should do keyword research before writing an article. But also, keep in mind, that you can’t always do research before writing every single article and hence it is okay to write an article where you didn’t do keyword research. The best tool that I use for a keyword is Keyword Planner by Google itself. Keyword Search will stay as the part of SEO factors in 2017 and in long-term future. Google is updating its algorithm just to penalize sites that are overdoing SEO but not working on the quality of the articles. For example, if you are over-commenting, over-backlinking, over-optimizing, too much keyword stuffing, all these will get you to penalty and even removal from search engine results. This has been said enough number of times now and is true. If writing more in-depth high-quality content, you can get ahead of big players as well. Writing quality content is also being suggested by Professional writer like Zac Johnson. How do you write quality content? There are several methods you can use but one I would say is that it should be unique, second, it should have detailed information, third, it should be readable with sub-headings and fourth, it should have proper images and videos plus the references and other data-driven information. All these things make your article great! 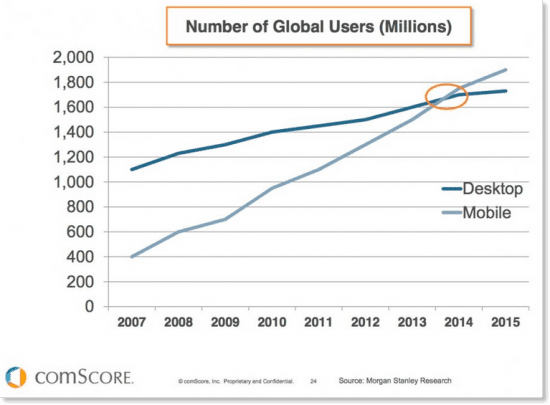 As per research by Morgan Stanley and published by ComScore, mobile users are increasing everyday surpassing desktop or PC users when it comes to internet usage. This trend is continued with the use of more mobiles and more people are getting online, especially when Android is coming up and penetrating into the masses so quickly. Your site must be mobile-friendly. If possible, try to make your website with AMP since that is going to help you in long run. To make it more user-friendly, another thing you can do is to have a responsive theme. Responsive WordPress themes are those that change the way the website will open as per the resolution and screen size of the device being used to access your blog or website. We know the importance of backlinks in SEO. Backlinks are the way Google knows which website is more important than others. In the original article and thesis published by Page and Brin, they mentioned all about backlinks and how to measure PageRank from there. Now, when the word backlink is heard, people think of directory submissions, commenting using commentLuv, guest posting etc. All these things are fine but when it comes to terms of Google, any backlink created intentionally to spam Google will be considered as spam overall. And that is why I have used the term natural backlinks. Natural backlinks are those that you acquire without putting your efforts into it. Natural backlinks come in when you write epic content and people link to that themselves. That is where you start to get natural backlinks and that weighs much more than anything else. Natural backlinks are one of the vital factors in blogging and need to look into as one of the major SEO factors. There are studies which tell that most people will leave your website if it doesn’t load in within 2 seconds. So you have two seconds – stay or leave. How to check page speed? I would follow just one link – Google’s insight tool. There are several SEO factors that affect page speed but what as a WordPress site owner what you can do is you can simply remove those plugins that you are not using. If you are using any shared hosting plan, you may wanna recheck about the hosting plan that you are on and consider of changing if you are able to spend a bit more. There are many other SEO factors that you can do to reduce page load time like correcting the CSS code etc which might be a bit technical. On-Page SEO is very critical for getting better ranked and can’t be overlooked. This includes optimizing your title, meta, sub-headings, the inclusion of images and optimizing them etc. Here is a checklist of on-page SEO which we can consider as a checklist and can work on On-page SEO. For WordPress owners, the easiest way is to use Yoast plugin which can help you with all the on-page SEO issues. Besides all these, you should also make sure to set right permalink for your site and do not change once you have made it. Another key point in SEO factors is Internal linking. I can’t emphasize how important internal link building is. This SEO factor is a very crucial part of SEO today and will remain so for years to come. What is internal linking? This is: Are off-page SEO and link building the same? As I said Internal linking strategy is equally important to follow. It tells Google that your other pages approve of a page that is newly created and so on. As per experts’ studies, this is one of the important parts of SEO. Google will keep on changing its algorithm and you should also keep updating but one thing you need to be very focused on creating value-added content that people want to link to and when you find such content, never forget to link to that. Linking to others’ work does give you positive credits and this is very important for SEO. I am sure the above-mentioned SEO factors are worth following. Please do share your views on these SEO factors. What are the changes in SEO happens in 2018 and beyond? We invite your valuable views in this regard. Share your views in the comment box given below. Here is a video (tutorial) which explains in detail about the basic steps a blogger wants to know about SEO. Thanks, Daragh Walsh for this wonderful share. This is a Guest Post contribution by Pankaj Dhawan, a young SEO Expert, a full-time blogger from Rajasthan. More information about him is given in the Author Bio Column. Thanks, Pankaj for your wonderful contribution to the pages of #Philipscom. I appreciate the effort you put in. Keep sharing. All Good Wishes From Philipscom Team. Thanks for introducing Pankaj Dhawan for more readers. Pankaj compiled a very useful list of things that anyone should follow to enhance the SEO optimisation of a website. Looking forward to read more updates from this blog soon. Thanks much for the appreciation. I am reading everywhere people are still talking about directory submission and blog commenting for SEO where I realize that epic content and keyword search still prevails and are important in SEO world. Thanks a lot Philip sir for giving me the opportunity to write here. I will look forward to continue contributing. It is indeed a great joy to work with you. Thanks for the efforts you put in for this wonderful write-up. Quality Content is the cornerstone of any web marketing plan, and SEO is definitely no exception. In the era of Smartphone, your website must mobile friendly to rank better in google. It is so disappointing when you cannot have great mobile user experience on the websites you followed on the desktop. We know very well no one want to waste their time on slow loading pages or unreachable websites. If your website is slow it will definitely affect your CTR and overall user experience. Eventually, thanks for sharing these wonderful tips with us. Thanks for stopping by Amar. Glad to hear your views on SEO trends in 2017. This is yet another helpful post for the newbies. Content is King, but SEO is the backbone of any website. A good combination both can do wonders. These are the few factors that are important in 2017 and will remain so in coming years. Several other strategies have long gone and we used to hear Squidoo and other websites – all are dumped in the past. A well explained post, indeed a very good write-up on SEO. Sir thank you for sharing such a lot of information thru this post. Hi Philip and Pankaj. As always, extremely useful and informative post. Well worth a read. The rules for SEO are always changing, and it’s good to get an update on what’s new and what we can do, and cannot do. I hope guest blogs and comments are still allowed activities, yes? We’re just sharing knowledge and talking on a blog, which is a good thing, I hope. That is what my intention was – to keep readers updated as what is to be done to get more from Google. Nice to see your post here on philipscom. And these tips are really good and informative. Dear Philip Sir, This is my first visit to your blog, and I was searching for the blogs who are providing SEO tactics and landed on your blog. Improvements in Blog Rankings on search engines is not so easy, but if someone follows all tactics in a right way, then it could be little easy. Your tactics are excellent and yeah I’m using few of these techniques from last 1 year and getting a good result. Please write more articles on SEO because your writing skill is awesome and so easy to understand for readers. And I would love to come again on your blog. Do let me know whenever you write new blog post. Interesting post dude.. helps to newbie bloggers. Keep writing such informative posts. Thank you for your article. It’s a great post that all newbie search engine specialists and bloggers must read! You’ve mentioned that it’s crucial to reduce the page load time and I totally agree that page load speed is one of the most important on-page ranking factors. I’ve got a question. I run a blog and I’ve read on the Backlinko’s website that Google is planning to increase the role of Https encryption in the process of ranking. But there is a problem – websites that use https have a significantly lower page load speed comparing to those that use regular Http. So is it worth transferring my website to the Https encryption or it’s better to use regular Http and save my website’s load speed? PS: I found this post on the pages of Kingged curated by philips and i upvoted it and posted this comment there. This article is also good in this we easily know about the factor of SEO this is also useful for beginners. It is absolutely true that there are plenty of SEO factors that Google considers before ranking your website. Nowadays content is very important and if the content is good audiences want to read your post.I really appreciate your 7th factor. 1)It provides your audience with further reading options. 2)It also helps to improve your ranking for certain keywords. You have an Interesting post. SEO is an ever-evolving industry. In the past few years, we’ve seen Google make a steady push for rich content, quality links, and a perfect mobile experience. A well written and interesting article, thank you. Nice one. No matter how SEO will gonna change in further years, Content, and user experience will always be very important for any SEO strategy. Wow!!! Such a great information… I really found this post superb… it shows how gud knowledge you have about a particular topic… thanks for sharing such a great information. Keep up the gud work. These SEO Factors all online writers and bloggers should note while they creating their posts. I often care about content that ignores page loading speed, this affect our ranking? I am book marking this post for my further check. This is my first visit to your website. You have such a lot of information spread all over these pages,. Nice blog pages. thanks for sharing this post, really i like your blog post. Great work good job keep it up the godd work Thanks. As the title says 7 SEO factor for 2018 and “beyond”, it is true because SEO is must for optimizing any website. If an online business site, blogs site or any wants to rank high in the SERP, SEO is mandatory. And yes these 7 factors are the key points one should keep in mind for SEO.